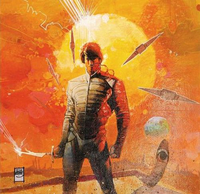 , , Sacrifice Throne of the High City: You become the monarch. CyborgAeon: Honestly, the way the deck has been winning has started to make Brutalizer Exarch seem slightly less practical, but it still a less complex loop than the Eternal Witness / Beast Within line. Winning through attrition is still on the table, so all in all Brutalizer Exarch still puts in a lot of work, but the rest of the deck sort of might not need him anymore. However, if i do replace him for something, I want it to be something as practical and useful. 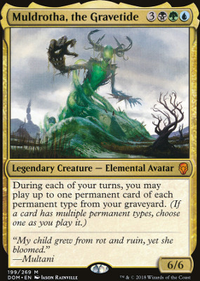 Nothing really stands out to me though and a tutor is a tutor and I need every tutor that can look for Temur Sabertooth . Throne of the High City is super meh, IMO. I really don't like saccing my own lands. 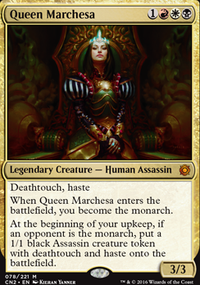 I don't draw many, and monarch is hard to hold with all the Swan Song s in my meta. Glad you liked Duskwatch Recruiter Flip: Hands down my favorite outlet, since you don't get non-creatures out of the deck when going infinite with it. I've been wanting to explore the possibility of Memory Jar loops. Aside from that, I'm pretty content with the deck, it's very consistent as much as it can be at least. You have a fairly low amount of lands. I would add a couple more, as well as replacing some of the lands with utility lands where possible. I am a big fan of Throne of the High City as it is fairly easy to steal the monarchy back and provides much needed card draw. I would cut Arms Dealer as the effect is way too expensive for 4 damage and Gempalm Incinerator as it only targets creatures. Also all of the cards that just produce small amount of tokens, like Krenko's Command , Dragon Fodder , Hordeling Outburst and especially Goblin Rally . They just do not do enough to further your gamestate or claw you back into the game. Goblin Grenade 's 5 damage just is not impactful enough when there are 4 players with 40 life each. Hells - Ive been playing both Throne and Arch mostly because I knew that I wanted one of them, but I wasn't sure which one was better. Im currently leaning towards Throne of the High City, being able to hide between Glacial Chasm makes it relatively easy to hold onto the monarchy, and if I ever do lose the monarchy I have lots of ways to recur the land and activate it again. Whichever one I cut will become another basic forest. I cut Diamond Valley for Worthy Cause for two reasons. First, Phyrexian Tower is the better sac land for child, so if you were ever tutoring for a sac land it was almost always that one. And second, having a way to sac child at instant speed that can hide in your hand as well as get around nonbasic land hate has been very useful. 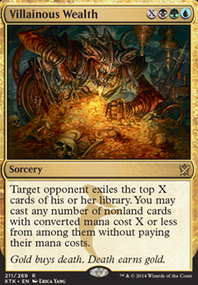 The lifegain is nice, but its mostly just the best repeatable nonland sac outlet for child. As for Bound, the card has been a house. It was something that I cut a while ago but definitely missed having access to. Being able to sac child as well as pick it back up in the same card is very powerful, and being able to regrow things at instant speed has been a wonderful tool for beating mass grave hate like Bojuka Bog or Rest in Peace. 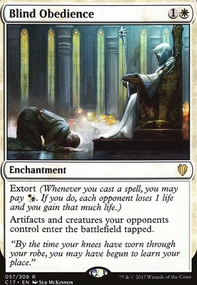 Occasionally you cast the Determined side of the card to cantrip or force Child through some countermagic, but a majority of the time I am casting it as a wrath + 5x Regrowth. 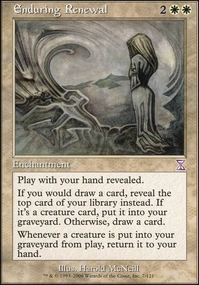 The cycle lands do a lot of work, being cantrips early, land drops for exploration openers, and in the mid to late game a way to get extra value off of Life from the Loam like you mentioned. They aren't there specifically for any one of those reasons, instead its the combination of them all that make them worthwhile. It is possible that seven cycling lands is too many, Forgotten Cave is the one that floats in and out of the list depending on my mood, it should likely just be another basic forest. HOLY MOTHER OF BEANS THIS DECK LOOKS SO COOL. Never in my entire life did I imagine myself looking at contaminated bond and nettling curse and being like "Heck yeah those cards are gonna be awesome!" You've truly created something outstanding here, friend, and I hope you're at least half as proud of it as I am excited about it. Coveted Jewel and Marchesa's Decree are Super fun. Watching kids fight over the Monarchy and the Jewel gives me life. Similarly, Throne of the High City is a great land. Sleeper Agent is on point, thematically (It was Xantcha's original card)) and mechanically. I feel like Gravestorm will probably disappoint you? Phyrexian Arena seems a lot more reliable. Please update with some cool stories of playing this deck, I am intrigued to hear about how it does. 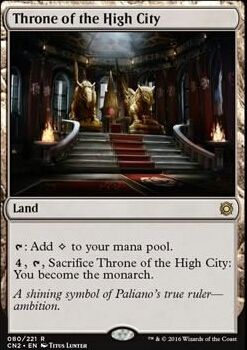 Throne of the High City is coming up as banned in legacy. But the card is legal to play. I think it may have gotten caught in the conspiracy coding when the set came out, or its just a bug with some other card potentially. xXBuddhaXx: While I would love to run Mox Amber in here, the only things that would make it active would be Daretti himself or Chandra, Flamecaller. You can't use it to power anything out, so I feel it's an almost dead card. Arch of Orazca hasn't been bad. Granted, it costs 5 to draw one card. The downfall I see with Throne of the High City is that you will get one card out of it, then have to fight over it every turn after. Sure, you can bring it back with Crucible of Worlds, but you're not only wasting your land drop for the turn, but also the four mana required to activate it, essentially costing you 5 mana while not expanding your mana base. Mirrorworks is always hit and miss. When I get it onto the battlefield, it'll usually make copies of mana rocks or other utility artifacts. Otherwise, I'll just pitch it to Daretti. I have a hard time cutting it from my list, but would be one of the firsts on the chopping block if something amazing came along. Throne of the High City, Ash Barrens, and cycling lands are all good options.